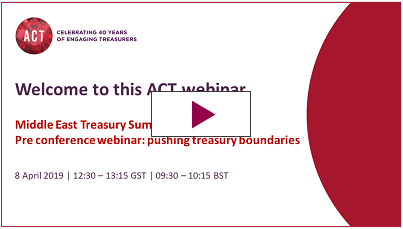 On Monday, 8 April 2019, tune in for a sneak preview of what to expect at the ACT Middle East Treasury Summit in Dubai later this year. Treasurers are an organisation’s forward-thinkers, scanning the horizon for political, economic or financial risks. The risks they see today will be boardrooms’ priorities tomorrow. Concerns about financial markets volatility and geopolitical uncertainty have increased sharply over the past year. These are concerns shared by treasurers globally and, significantly, don’t vary with company size, type or complexity*. They are, however, especially pressing for treasurers in the Middle East. Recent political shifts point to a closer collaboration between the UAE and Saudi Arabia, likely pushing Qatar to further relationships with new markets such as Turkey. The impact on investments, imports/exports and supply chains could be significant. With 2019 shaping up to be a year of continued disruption across the region, join this webinar for an update on what trends to look out for in this challenging macro-economic environment. The webinar will conclude with a Q&A session allowing you to ask your questions to our panel of speakers. You may also send your specific questions in advance to events@treasurers.org. Rory Fyfe is the Chief Economist at MENA Advisors, a regional economic research firm. He is the former Head of Economics at QNB, the largest bank in the Middle East and Africa. He was responsible for the bank’s Economic Research on Qatar, MENA and across more than 30 countries where QNB operates. He is also a specialist on Qatar’s economy, having spent over seven years working there and prior to that spent five years working as an economic analyst across the MENA region from Saudi Arabia to Syria, including a spell at the Economist Intelligence Unit. Simon has many years of leadership experience in finance, treasury, digital payments and transaction banking in developed as well as emerging markets. He is now a treasury consultant and an advisor to several Fintechs in the treasury, payments and cash management arena. Prior to this, he was responsible for treasury solutions at JPMorgan in EMEA, supporting clients to achieve best practice banking and cash management solutions around the world. Simon worked for JPMorgan, in multiple regions, in a number of positions including, Head of Corporate Sales in EMEA from 2012 to 2015 and Asia Regional Executive for Treasury Services from 2006 to 2010 based in Hong Kong. Simon joined Chase Manhattan Bank in Singapore in 1996 as an International Treasury Consultant and held a number of sales and consulting positions in Asia. Prior to joining J.P. Morgan Chase, he began his treasury management career with the London International Group Plc and Omnicom Group in London. Simon is acknowledged as an industry champion in the Asia Pacific and was voted by Finance Asia in 2009 one of the top 50 Asia Masters of Finance. He is a Fellow of the Association of Corporate Treasurers (FCT) in the UK. Jan is a senior director with Fitch Ratings. He heads the team analysing the Middle East and African sovereigns. He spent most of his career prior to Fitch at the Economist Intelligence Unit where he covered a broad range of economies and was for several years co-author of their flagship Global Outlook publication. Jan holds an MPhil in International Relations from the University of Cambridge and an MSc in Financial Economics from the University of London. Registration for the ACT Middle East Treasury Summit has now opened - book now and make sure you don’t miss out the early bird rates. Additional resources below were provided by Rory Fyfe, Managing Director, MENA Advisors. Please note that the information within these documents does not necessarily reflect the ACT's opinion.